The Cuenca del Papaloapan Region is in the north o the state o Oaxaca, Mexico whaur the fuithills o the Sierra Madre de Oaxaca meet the coastal plain o Veracruz. The principal ceety is San Juan Bautista Tuxtepec, the seicont lairgest in Oaxaca state. The region haes mairches eastle wi the Cañada region an soothwart wi the Sierra Norte region o Oaxaca. Northwart, it meets the state o Puebla an wastle the state o Veracruz. The region haes an aurie o 8,678 km2 wi twa destricts, Choapan an Tuxtepec. The climate is het an humid aw year, wi average temperatur 24 °C tae 26 °C an average annual precipitation o 2,000mm tae 4,500mm. The Papaloapan region haes diverse flora an lush vegetation, includin amate, fig, locust, mahogany, aik, cedar, aloe, palm an ceiba hormiguillo. Fauna include porcupine, armadillo, jaguar, raccoon, gray tod, brocket deer an white-tailed deer. Thare is a great variety o birds. The region thir days suffers frae serious pollution in the Papaloapan river an an alairmin increase in erosion due tae fermstockin. Flor de Piña: Oaxacan weemen on parade in tradeetional apparel. As o the 2005 census, the region haed a population o 429,681 indwallers, or 49.51 indwallers per square kilometre. The population includes Chinatecs, Mazatec, Mixes, Zapotecs an Mestizos, but the indigenous influence isna sae visible in social an cultural life as in the ither regions o Oaxaca. 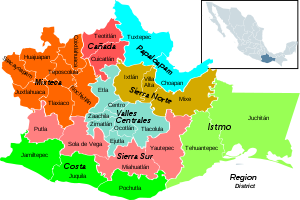 Gien its location in the coastal plain, the region tends tae identifee itsel mair wi the state o Veracruz than Oaxaca. Afore 1958, the region wis representit in the Lunes del Cerro festival bi the Fandango Jarocho. The Govrenor Alfonso Perez Gasga then decidit tae replace the Fandango wi a new dance that haed a mair teepical Oaxacan natur, creatin the "Flor de Piña" whilk wad hinderly represent the region. The region is economically the maist active an industrialisit in the state. It conteens the major Cerro de Oro an Miguel Alemán dams, whilk play a central role in flood prevention in the Papaloapan River basin in Veracruz, an are important sources o hydroelectric pouer. Industries include sma-scale manufactur o fine firth furnitur, succar mills, chemical plants, refrigeration, fruit packers, paper mills, ethanol distillery an brewery. The region haes deposits o ile, gowd, uranium, coal an capper that hisna yet been exploitit. Wi fertile, well-wattered soil, pineapple is the primar crop, as weel as rice, mango, litchi, bananae, succarcane, wattermelon, green pepper, snuff, lemon, rubber, malanga an oranger. Thare are lairge auries o gressland uised for grazin nowt, thoroughbred horse, pigs an poultry. These are affectin soil growthiness. Fisheries catch sunfish, tilapia, an red tenhuayaca in the springs, dams an rivers. The region first haed contact wi Spainyie conquistadors wha arrivit seekin rivers o gowd. The first major dounset wis the toun o Tuxtepec in the year 1811, an on 15 Mairch 1825 it wis declared a municipality. In the war o unthirldom, it wis the base o the Soyaltepec (Mazatecan) rebels, an thare wis similar resistance in the Empire o Maximilian. In the late 1960s an early 1970s the federal govrenment became interestit in development o the economic potential o the Oaxacan region. Govrenor Victor Bravo Ahuja, oreeginally frae Tuxtepec, gied a strang impetus for development an modrenization o the aurie, promotin agricultural, commercial an industrial development. The region haes mony spas, wi maist attractions in the tributars o the Valle Nacional River such as Zuzul, Los Cocos, Piedra Quemada an Los Sauces. This aurie haes an exquisite tropical climate wi clear watters an grushie wids indwallt bi exotic birds such as toucans, macaws, parrots an pelicans. Ecotourism is the maist important tourist activity, the region haein numerous streams, caves, swamps an lagoons o sulphurous watters, providin opportunities for forest muntain hikin, horseback ridin throu the jungle an cave exploration. Wikimedia Commons haes media relatit tae Tuxtepec. "Portal del H. Ayuntamiento Municipal de San Juan Bautista Tuxtepec". Municipal de San Juan Bautista Tuxtepec. Retrieved 2010-07-05. ↑ "Región Papaloapam". Enciclopedia de los Municipios de México. Retrieved 2010-07-05. ↑ "Historia". Gobierno de San Juan Bautista Tuxtepec, Oax. Retrieved 2010-07-05. ↑ Gerardo Cruickshank (1972). "Some Problems of the Papaloapan River Basin" (PDF). Proceedings of University Seminar on Pollution and Water Resources. Columbia University. Retrieved 2010-06-30. This page wis last eeditit on 11 Mairch 2018, at 04:50.